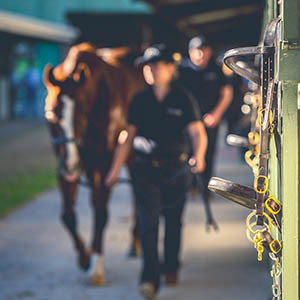 The scene is set for Queensland’s richest raceday with a string of outstanding performances at today’s Road to Magic Millions Raceday at Doomben. Fittingly Magic Millions graduates provided the biggest highlights of an action packed day including a number of stakes race victories. 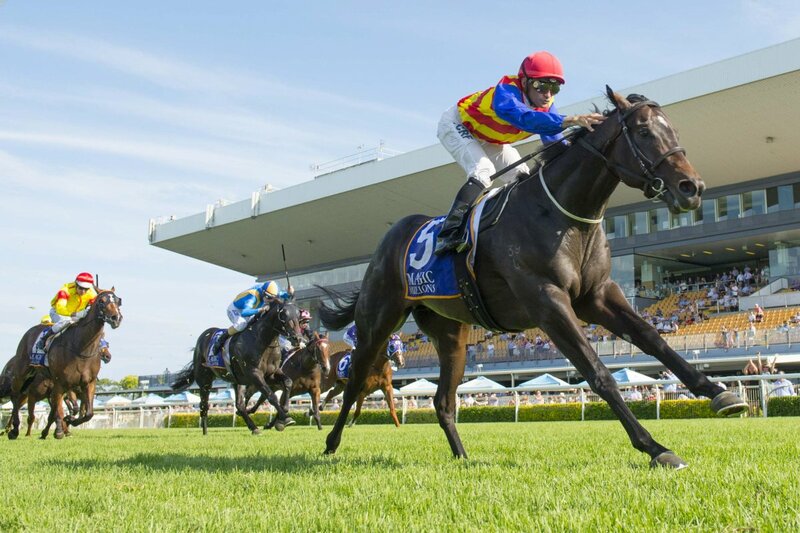 Among the day’s stars was Pierata who confirmed his status as the horse to beat in the $2 million Gold Coast Magic Millions 3YO Guineas with a spectacular win in the Group Three Vo Rogue Plate (1350m). A colt by former champion Magic Millions graduate Pierro, Pierata sat midfield for much of the race before coming with a paralysing turn of foot much to the delight of his jubilant connections. Should Pierata deliver as favourite in the Magic Millions Guineas in a fortnight he will scoop $1.7 million in what would be the biggest single pay day in Queensland racing history. First prizemoney for the Guineas is $1.2 million while Pierata would sweep a $500,000 Summer Crown bonus if successful on the Coast. Trainer Greg Hickman purchased Pierata for $160,000 at last year’s Gold Coast Yearling Sale from the Kitchwin Hills draft. Earlier in the afternoon the all female ownership of Meryl celebrated her breakthrough group victory in the BJ McLachlan Stakes. A member of the Lee Curtis stable, Meryl came between runners in the straight to win impressively under Christian Reith. A $150,000 Gold Coast Yearling Sale buy for Randwick Bloodstock and Mystery Downs from Riversdale, Meryl made history by becoming the first stakes winner for her sire, Epaulette – who a week earlier was represented by his first winner Katy’s Daughter. Being entirely raced by ladies, Meryl is running for a share of the $500,000 Magic Millions Racing Women bonus – a world first initiative run in conjunction with the $2 million Magic Millions 2YO Classic (1200m). Riversdale will offer the Exceed and Excel half brother to Meryl at the upcoming 2018 Gold Coast Yearling Sale. Care to Think booked his place in the field for the $1 million Woodford Reserve Magic Millions Cup (1400m) with an extraordinary success in the Magic Millions The Buffering (1350m). An astute $16,000 National Yearling Sale buy for leading Queensland bloodstock agent Neil Jenkinson from Ambergate Farm, Care to Think is now the winner of five of his 10 starts and looks one of the country’s most progressive gallopers. Care to Think is trained at Murwillumbah by Matthew Dunn and the stable celebrated a double when Reset’s daughter Don’tbabylon won the listed Nudgee Stakes and clinched a wildcard berth into the $1 million It’s Live! 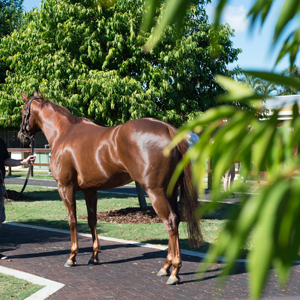 In QLD Magic Millions Fillies & Mares (1300m). Co-trainers Kelso Wood and Patricia Gesler were both lost for words when their exciting sprinter Snitzkraft scored a dashing win in the listed Magic Millions Falvelon Quality (1050m). 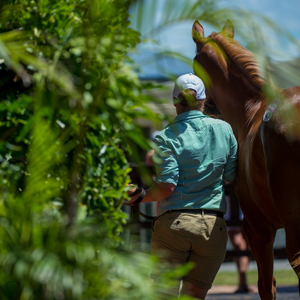 An Arrowfield Stud graduate from the Gold Coast Yearling Sale, Snitzkraft as his name suggests is a son of Snitzel and his part owners include AFL legend Leigh Matthews. In winning the Falvelon, Snitzkraft earned a wildcard berth into the $1 million Harrolds Magic Millions Snippets (1200m). Winning jockey Larry Cassidy wished the Gold Coast feature was over a shorter distance, but said his mount did settle once he found the front in the Falvelon and was confident of him being on his game in a fortnight’s time. Veteran local galloper Someday scored the biggest win of his career when he rattled home to win the $300,000 listed Magic Millions Bernborough Handicap (1600m). 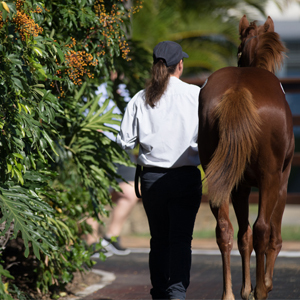 A National Weanling Sale graduate from Raheen Stud, Someday was welcomed back to the winner’s stall by trainer Desleigh Forster who said her charge had been the victim of some ordinary rides of recent times. Forster even revealed some of the owners had recommended retiring the son of Falvelon after his previous start, but thankfully she was able to talk them around. Earlier on the Doomben card Just Orm and Stonecast were both victorious – both sold through the famous Gold Coast sale ring of Magic Millions. 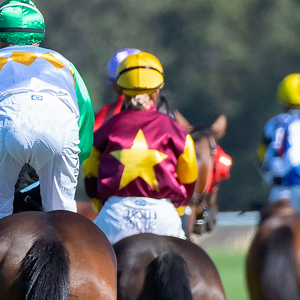 Meanwhile, the winning run of Gold Coast sold two-year-olds extended interstate with both the Melbourne and Sydney juvenile races won by Magic Millions graduates. Graceful Storm (Hinchinbrook) went two for two when successful for John and Patrick Moloney. John purchased Graceful Storm from Woodside Park Stud for $110,000. In Sydney, Quackerjack (Not a Single Doubt) booked its place in the field for the $2 million Magic Millions 2YO Classic when a strong finishing winner at Randwick. Bred and sold by Rosari Farm for $240,000, Quackerjack is trained by Mark Newnham. Rosari will present an I Am Invincible half sister at the 2018 Gold Coast Yearling Sale.